A Verb for Keeping Warm: Knitty 2009: Bitterroot & Pyroclastic - Ka Boom! So, let’s continue on with are lil’ whirlwind, shall we? Ok! We shall! Because what would life be if we didn't have ups to go with our downs? Perhaps stable, secure...maybe in my next life. In the new release of Knitty Winter 09, we are fortunate to have our yarn and fiber featured in 2 patterns – by 2 amazing designers, Rosemary Hill and Marlowe Crawford. Dyeing, ok, I can do it – there are times, especially with natural dyes to create certain colors, or color combinations. And, then, there’s the physical aspect – which has taken a certain toll on my body over the past couple years. But designing, I have serious respect and a certain amount of awe around people like Marlowe and Romi who can take a material and transform it into a beautiful, inspiring, useful object that keep you warm. From literally sitting beside Marlowe on the couch throughout this process, and from talking to Romi, there are so many stages of designing that might not be obvious at first glance. Sure, there’s the idea, I am very familiar with getting ideas – but bringing that idea to life is a whole other set of complicated commitments. There’s the idea, then starting to swatch, knitting, ripping, knitting, ripping, pencil, paper, erase, scratch, calculate, multiply, do it again, alter, shift, change, knit, test knit, name, re-name, photograph, choose photos, edit photos, typography, format document, get it out to the public, or in the case of Knitty, submit your pattern, and let the waiting game begin. The pattern is accepted, yea, hoots and hollers, sipping of champagne, then mum’s the word. While the worker bees over at Knitty are and have been doing much pretty the same thing to the patterns about to be released. And, this to our beloved knitter and spinners is FREE to you. This is truly a gift of talent, thought, and love. Sometimes people ask me if I plan to design something – my goodness. At this moment, I could not be happier supporting people like Marlowe and Romi, those that have dedicated themselves to the process with materials. Their designs encourage me to use the best materials and to create interesting colorways that hopefully will inspire them to continue creating such beautiful pieces. Pyroclastic, by Marlowe Crawford, feature the dynamic paring of form meeting function. 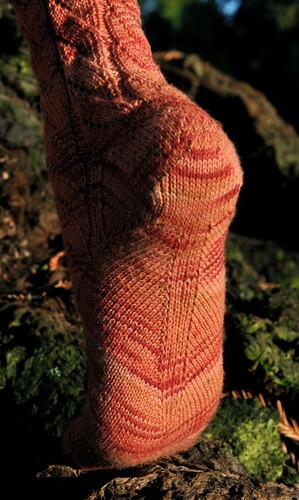 This pair of socks which have a sweet, classic, cable design are coupled with the shaped arch. The shaped arch creates a biased fabric which keeps the sock snug even after wearing them multiple times. Furthermore, for my butterfly brain, fluttering here and there, is often times plagued with 2nd sock syndrome, the shaping through the arch, makes knitting the sock go by very fast. 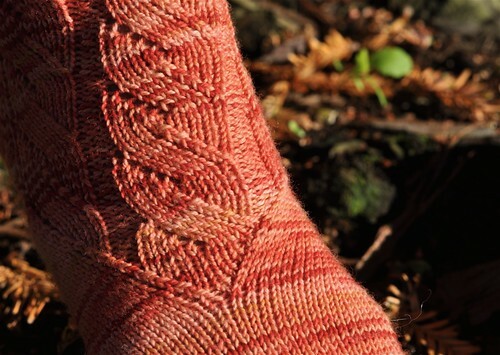 Marlowe used our Creating Superwash Merino yarn in Burnt Ember. 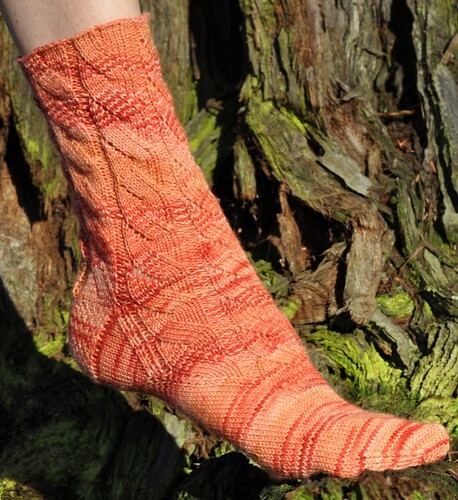 These socks will be a gift for my Mom – another avid supporter of Marlowe and her designs. Well, my newly cast-on Bitterroot is calling my name. Be back soon with photos! The Bitterroot is amazing. Reminds me that I need to buckle down and get to work on my mitten pattern!